The food created by siblings Andrew, Irene, and Margaret Li reflects their very personal culinary passions. Growing up in a Chinese-American family in Brookline, hand-folded dumplings and Fruit Roll-Ups were among their childhood favorites. 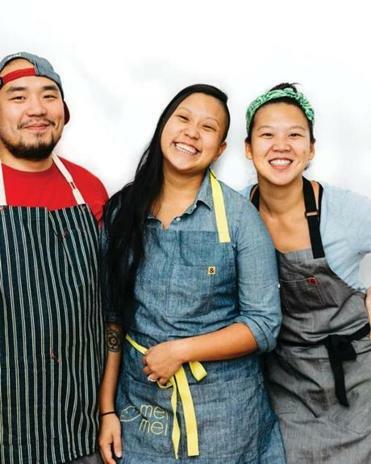 Since opening their food truck Mei Mei Street Kitchen in 2012 and their Audubon Circle restaurant a year later, the trio’s unique take on Chinese techniques and New England ingredients has developed a loyal following. More than 100 of their favorite dishes can be found in the new cookbook “Double Awesome Chinese Food: Irresistible and Totally Achievable Recipes from our Chinese-American Kitchen.” The book is named for one of Mei Mei’s most beloved menu items, the Double Awesome. The scallion pancake, egg, Vermont cheddar cheese, and pesto sandwich was created and named on a whim when Margaret (known by her family as Mei) was cooking breakfast for herself on the food truck. The name stuck and the dish stayed on the menu. Margaret and Andrew Li spoke about the book by phone. Margaret, who lives in North Carolina, was the primary writer on the book. She added to the Li family with the birth of her second child five days before the interview. “The question was really which one would come first, the book baby or the actual baby,” Margaret says. Q. Family is clearly important to you all. How is that reflected in your food? Margaret: We’ve always been a food family. It’s been just an important way of connecting to each other and spending time with the family every night. That kind of extended into the way this whole food business and our careers ended up. The food that we cook is all really about sharing. It’s not meals for one. It’s things that we love to eat together, or things that we ate growing up. Andrew: One of my most favorite things is talking to people about their family gatherings, and that one family member’s specific dish that they’re always looking forward to and craving all year long. It’s like grandma’s mashed potatoes, or Uncle Ed’s turducken. Those stories, they really get me, and you can almost feel the electricity when people sit down and they’re talking about being with their family. It’s really something that hits home for all of us. Q. Is there a food from your childhood that you crave in that way? Margaret: One of the dishes that we actually write about in the book that really reminds me of family is what we call Thanksgiving Rice Porridge, which is basically just porridge with turkey. But it combines so much of the holidays and all the family coming together. It’s really the simplest dish possible — rice and water, and then you toss turkey bones into it. But it becomes this magical dish, and the smell of it pervades the house at the holidays. It’s so simple, but then you can do anything you want to it. Andrew: I put extra fried doughnuts in my rice porridge, actually. Q. How do you think about balancing the influences of your Chinese and New England heritage with your food? Margaret: That’s something that we think about a lot. Because we care about the food system and local farms, using local ingredients in our food has been a driver from the beginning. But it’s not necessarily traditional to Chinese food. The joke we have about our food is that all of us love cheese and put it on everything, including our scallion pancakes and fried rice. If we’re standing in a kitchen and there’s ginger and scallions and garlic, and then there’s also cheese and butter, if we think those things would taste good together there’s no, like, ‘Oh, that doesn’t belong there, and that’s not Chinese food.’ We’re all just kind of creative scavengers when it comes to making food for ourselves. Q. As kids, could you have imagined working together in the food business? Andrew: For me, that’s a resounding no. Margaret: Andy had worked in the restaurant business in Boston for about a decade, from fine dining to chain restaurants, and he had the idea of starting the food truck and wanted to do it with the two of us, his sisters. Andrew: None of us went to culinary school. I had no idea that my sisters were so passionate about food until I started reading the blog they had been writing for probably five years at that point. Margaret was doing some underground supper clubs and random restaurant stuff. Irene had been living on a farm for a little while at that point. Margaret: Running the business from the beginning, from the food truck to the restaurant, and now with the cookbook, it’s always been a very collaborative sibling effort. Q. What’s it like to work with your siblings every day? Margaret: Despite the sometimes daily or hourly disagreements we would have, it is just so amazing that it has 100 percent brought us closer as a family. At the time I was living in London and Irene was in New York, it’s possible I might have stayed there if we hadn’t decided to open this business together. Whereas, now, we talk every day, and it makes me happy to be much closer as a family than we might otherwise have been. Andrew: Everything that they say about working with your siblings is true. I wouldn’t have had it any other way. It’s a give and take, and a blessing and a curse, but my sisters are super talented. I’m really proud of them in every way.